"I am bitterly, bitterly disappointed that not only is this protest going ahead but the size of the protest on what is the busiest shopping day of the year." We need to feel the fierce urgency of the now. Whatever you say, say something. We need to show civil intolerance of this. And let's ask as Ian Coulter did: "Where are the rights for the people trying to trade and build businesses?" 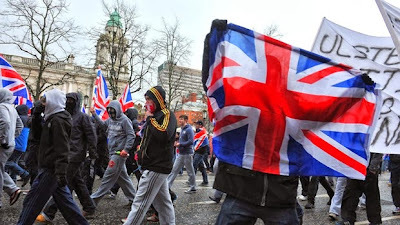 Previous posts on the affect of loyalist protests brand Belfast and Northern Ireland here and here.